It's not a sequel. It's not a spinoff or a remake. Maybe it's more like a reboot? Right now I'm thinking of Fargo, FX's new limited-run television series, as falling into the "inspired by" category. My favourite theory is that its story is a riff on the same "true story" which playfully (and apocryphally) inspired Joel and Ethan Coen's feature. It shares a universe, an aesthetic of darkly comic, casual violence, and perhaps an area code with the Coen brothers classic 1996 film of the same name, but there is little other explicit overlap. (However, careful fans might observe a mysterious briefcase the show's opening scene.) Still, television viewers tuning in will be reminded of the film by the big skies, the unforgettable North Minnesotan dialect and exaggeratedly rounded vowels ("aw geez", "you betcha! "), and the signature pacing and tone. There are significant risks in toying with a beloved and critically acclaimed movie on the small screen, but so far, with nary a wood chipper in sight, FX's Fargo has already begun to stand on its own snow-booted feet. With the blessing of the Coens, novelist and television writer Noah Hawley (Bones alum, and creator of The Unusuals) has brought together an amazing cast and a confident eye and ear to the world the filmmakers introduced us to almost 20 years ago. The film was set in 1987, mainly in the Minnesota hamlet of Brainerd. The FX series resets the action to 2006, takes us two hours north to Bemidji (which Wikipedia reveals has an almost identical population size as Brainerd), and offers a whole array of new characters and situations. The ten-episode, single-season story begins with the arrival of Lorne Malvo (Billy Bob Thornton, A Simple Plan, Bad Santa), a hired killer who quickly sets about turning the quiet, snowy town upside down, one repressed, put-upon denizen at a time. His first accidental target is Lester Nygaard (played by Sherlock and The Hobbit's Martin Freeman). 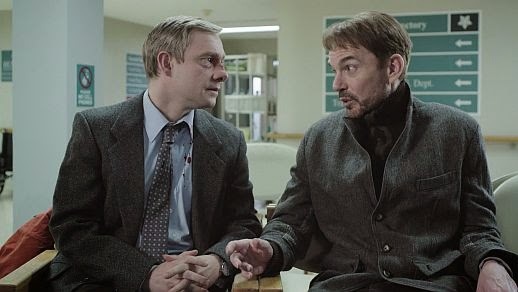 The British Freeman seamlessly pulls off the Midwestern accent and his hapless Lester somehow seems a full foot shorter than his Dr. Watson character. For Malvo, converting Nygaard – with his thankless job selling life insurance, dealing with a patronizing younger brother, and putting up with a self-esteem destroying wife of 18 years – is like shooting fish in a frozen barrel. After Lester's long-time bully and one-sided nemesis Sam Hess (Kevin O'Grady) is found murdered, Nygaard finds himself in the middle of a police investigation and a steadily increasing pile of dead bodies. And blood – lots of blood. 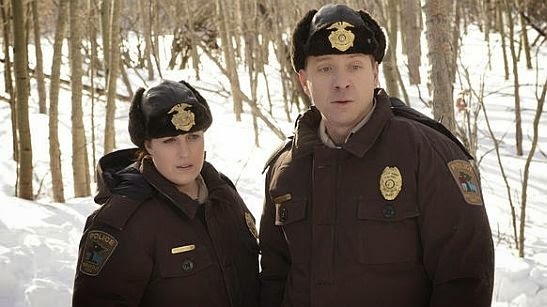 True to its on-screen roots, Bemidji also boasts a charming array of small town cops, including up-and-coming too-modest-for-her-own-competence Deputy Molly Solverson (Allison Tolman) and Breaking Bad's Bob Odenkirk – almost unrecognizable beneath his handlebar moustache and furry hat – as the bumbling, perpetually nauseated Deputy Bill. Tolman, a relative unknown alongside recognizable veterans like Freeman, Thornton and Keith Carradine (who plays Molly's father), steals every scene she's in with her sincerity, warmth, and folksy intelligence. Thornton's Malvo, No Country for Old Men haircut, friendly malice and all, is eminently watchable – a philosopher-sociopath who can breezily walk through any crowd leaving destruction in his wake. Thornton plays him as an archetypal trickster, a student of basic human nature who with a few choice words "("How do you feel about that?") can call out the inner psychopath in characters for whom "heck" is a profane utterance. But already what is most refreshing is the anthology format itself. Even in this first 90-minute episode, you can already experience the narrative freedom it offers. (Should Fargo return to FX for a second season, Hawley has promised it would have a new cast and a new story set in the Coen brothers' Minnesota universe.) Hawley penned each of the season's 10 episodes, and compared it to writing a "ten-hour movie." But television it is, and good television at that. With only 15 minutes left in the premiere, I can honestly say I didn't know who was going to survive to the next episode. Certainly skilled writers can accomplish this in multi-season stories (for two recent examples, see Breaking Bad and Game of Thrones) but rarely has that thrilling uncertainty felt so real, so fast. The best of American television has, until recently, been the long story, finding surprising value in the open-ended tendency of the network model, for decades premised on a syndication market. It was the purview of British television to tell shorter, tighter stories– one season at a time, with little expectation or need of extended runs. With True Detective, American Horror Story, and now with Fargo, it looks like that is beginning to change. Wouldn't ya know it? Fargo's second episode airs on Tuesday, at 10pm DST – on FX in the US, and FXX in Canada. The series also premieres tonight on Channel 4 in the UK.